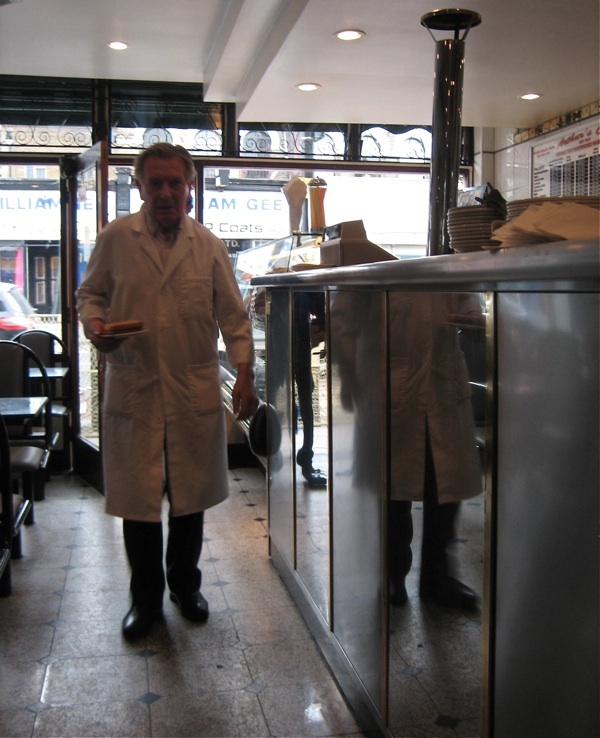 This is Arthur of the celebrated Arthur’s Cafe – in the Kingsland Rd since 1935. 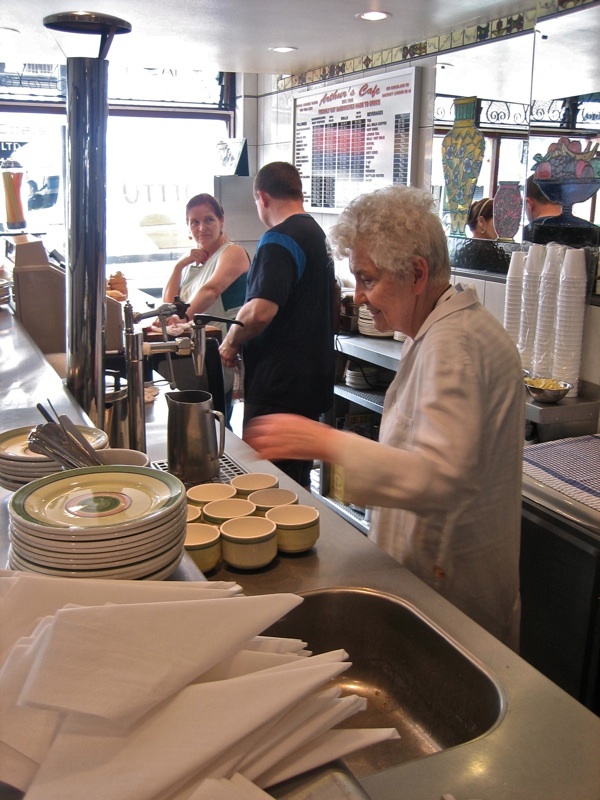 Even at ninety years old, Arthur was still running around his magnificent shining cafe, taking orders and serving customers with sprightly efficiency. Possessing the grace, good manners and handsome features of a young Trevor Howard, he was a charismatic figure, venerated in Dalston and throughout the East End. Imagine my excitement, when I paid a visit, to see Arthur waiting in the doorway of his cafe in anticipation of my arrival. My heart skipped a beat and I ran across the road to shake his hand. Then, taking advantage of the lull between the late breakfast trade and the early lunch trade, we sat down at the window table to enjoy the sunlight, and I found myself close up to his neatly styled grey locks and immaculately shaven jowls, while Arthur fixed his liquid grey eyes upon mine and commenced his story. “My grandfather is an actor, and this is the stage where he performs best,” James continued, as if to introduce Arthur who appeared on cue from upstairs, now changed into an identical but perfectly clean white coat and seemingly revived with a new energy. “Do you think you will still be here at ninety?” I whispered to James across the table. “If I’ve got my grandfather’s energy, I’ll still be here!” he replied with an emotional smile as Arthur breezed past, making sure that everything was in order before assuming his heroic position at the head of the steel counter – as he did each day since 1948 – tea towel over one shoulder, ready for whatever the lunch service would bring. 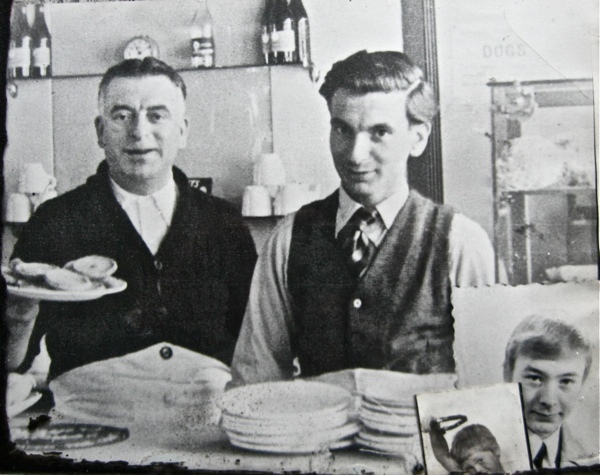 “I remember those custard tarts my dad was holding, they were threepence each” - Arthur at at twenty-one years old when he opened his own cafe in 1948 with the assistance of Arthur, his father. 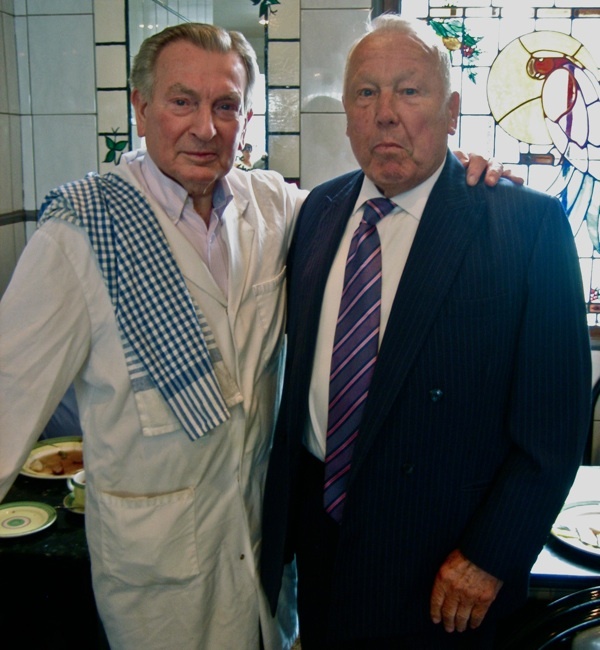 Inset shows, the third generation Arthur and his son James at Arthur’s Cafe. People mostly understand that sort of Cafe are the greatest places to eat ,great food, nice atmosphere and if you keep going back you tend to notice that most of the customers are the same ones every day .Why? because it becomes Their cafe and they know exactly what they want and they will get it everytime. I hope young James can carry on as long as his Late lamented Grandad . Fine life. No toast after eleven thirty, no chips before twelve. That I can get on board with. Hope it continues with his grandson. What a shame he’s gone, but what a life – or rather two lives, given that his working day began just after midnight! It’s wonderful that he was so active right to the end. Thoughts of Liver and Bacon have got me drooling – and what a great price for lunch. What an amazing Athlete, as well. My parents’ chippy pretty well destroyed their health after only 18 yrs of on-yer -feet ,14 hr days, six days a week in toronto,canada. Am looking forward to dining at Arthur’s Heavenly Cafe ! sad to see the passing of another legend. had more than one bacon sandwich there! thanks for all your efforts in the publishing of the site. reading it is my breakfast ritual. We are sometimes asked how to identify/define ‘British’. This obituary article made me think of my dogged Three Bridges Granny in Sussex and the family business (bicycle shop, lockups, garage, petrol pumps) and my uncle managing the daily running of it after his father’s premature death in 1953 – all an extension of the end of terrace house my mother grew up in after WW1 and the rise of high street traders (formerly servants in wealthy homes). My Granny’s day was about presiding at the head of the vast Tudor oak kitchen table and looking after the callers, the tradespeople, the neighbours and nearby grandchildren who popped in throughout the day. I have the big whicker laundry basket that used to be collected and taken to an East Grinstead laundry – the mechanics overalls? Her household things? Both? 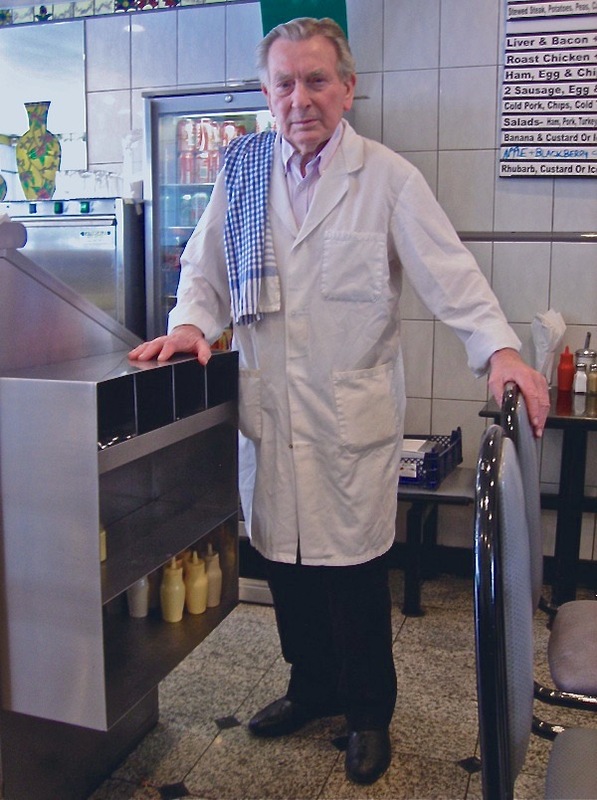 Traders like my grandparents and this faithful Bethnal Green cafe trader are fewer & fewer. My Grans’ Three Bridges no longer exists as the village high street. Three Bridges is a decimated suburb of Crawley now – its contained village character savaged by ‘progress’. A block of flats suts in the forecourt and Granny’s house is a set of offices now. I read this blog as others do – to fix in my mind the dots on the line of time as change overwhelms townscapes and to bear witness as The Gentle Author does. Change & progress choke on one another more often than not. I salute this cafe and hope with all my heart that it can continue in the same way for decades to come – an oasis of quiet reliability in an area taking hit after hit from those who claim to serve need but whose greedy hit & run motives are quite naked. We will always need these modest corners to provide homely respite – perhaps increasingly as the madness ramps up. What an amazing life – right up to the end. Goodbye Arthur. 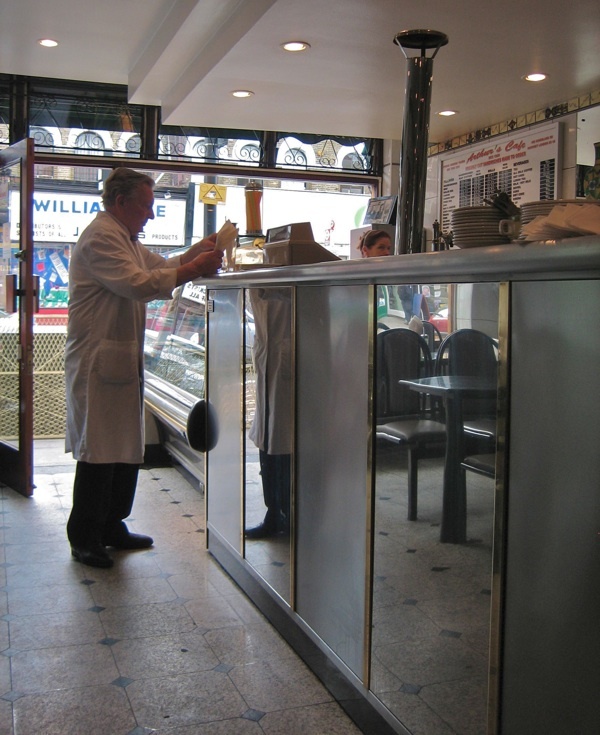 Arthur’s was my favourite cafe in London and I used it for nearly thirty years. Arthur was a character and would always have a word and a moan and if he liked you get a chop or a bit of steak out. I loved everything about it…the tea was strong and the bread delicious and covered in real butter, the lamb chops sweet and the chips just delicious and in the summer the salads with beetroot and onion were just as my nan would do one. But the staple for myself would have always been the sausage, egg and chips…the cure to many a hangover and the Godsend to many. 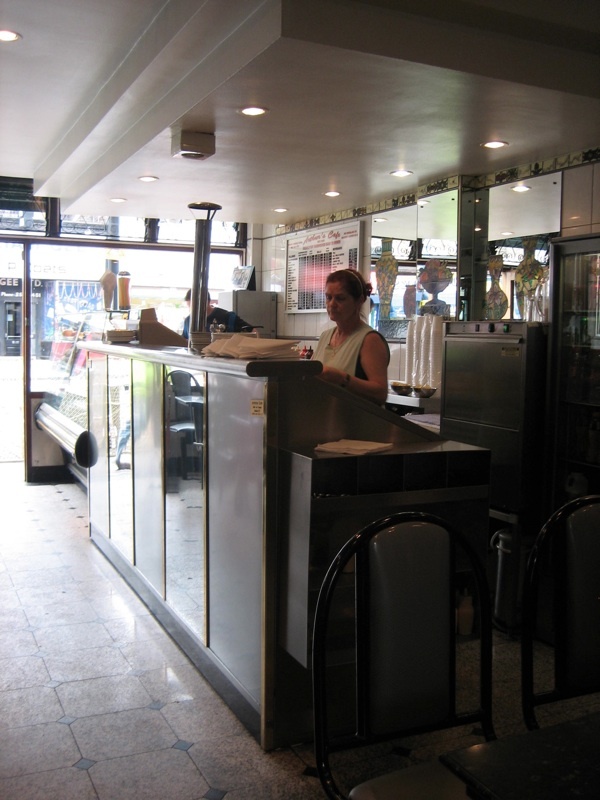 I used to know Nevio at Pellicci’s (who has also left us) and frequented there, but I loved Arthur’s as I lived just around the corner and have moved from London nearly ten years now. The area has changed beyond recognition now and this is sad news for a man and a cafe so much a part of my life there. Good luck to James and the rest of the family and long may it continue. Such a great story! And his youthful looks and vigor are testament to doing what you love and never stopping. My Nan Alice, ran the Peerless Laundry ( forerunner of dry cleaners) at 172 Kingsland Road, corner of Hows Street – not far from Arthurs Dad’s cafe. So knew the family well. In the late 50′s and 60′s my father worked for Watsons Newspaper Wholesalers ( later bought out by WHSMITH) which was a couple of doors down from Arthurs Cafe. After finishing their night work at 6am the lads would go into Arthurs to drink tea and play cards. This was ok until the breakfast trade started and Arthur would have to sling them out for being too noisy. I myself used Arthurs when I worked in Hackney. He would be whistling and taking orders at the same time. Always loved the stewed steak – with a little gravy or a lot of gravy. A huge loss for the london community, let’s hope James and his family may be able to continue Arthur’s legacy. RIP Arthur. So sad, Arthur’s Cafe is the Best Cafe there is, no question. Always a perfect gent, always spotless, as is his Cafe. I feel like a part of the old world has been taken, they just don’t make them like Arthur and his wife anymore! 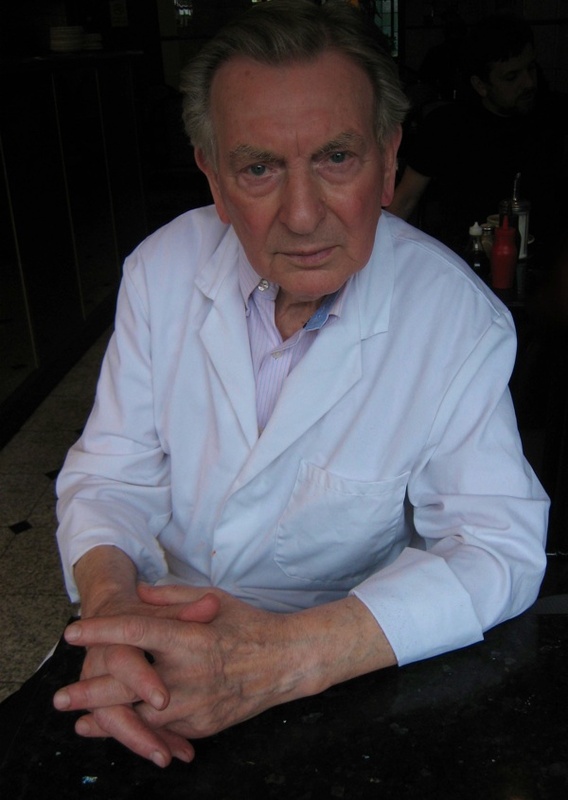 The Cafe will live on, but Arthur’s passing has left a giant hole in the world. Amazing. An institution in himself. RIP Arthur, and good luck to grandson James. Long may that spotless cafe continue…. So Long, Arthur Woodham (1926 – 2018) — R.I.P. Only been once. Late last year. Mr Woodham was present in his white coat. My lunch partner asked for vinegar (for her chips! what are people like?) & he said “you mean the house white.” I’ve been chuckling quietly to myself over that ever since. Lunch was lovely too. I ordered liver. It’s the only kind of place I ever order liver. Must go again soon. The best kind of local business. A true gentleman. Will be very much missed. RIP Arthur. A proper East End story. Arthur was an institution. Very sorry to hear of Arthur Woodham’s death. He and his estimable café were truly one of a kind. In the early 1990’s my workmates and I worked near the Waste, very slightly south down Kingsland Road from Arthur’s eponymous café and we soon became lunchtime regulars. Back then good and affordable places to eat were few and far between. So in hungry anticipation we’d walk the short journey to the front door of number 495 and be quietly acknowledged either by the man in the neat white overcoat and a spotless tea towel insouciantly at his shoulder, Arthur himself, or James, busy behind the counter, or Jenny, by the urn brewing up tea. On the tiled side wall between the end of the shining counter and the kitchen entrance hung the Perspex menu sign-board. Each day had it’s specials and once seated at one of the terrazzo tables and having given the menu a quick glance, you’d place your order with Arthur. Unfailingly he’d repeat back to you exactly what you’d chosen but in a completely different sequence. Just for the joy, yours but mainly his, of trying to confuse you. In summer, I might ask for a ham (cut from the bone) and salad (never forgetting the beetroot) sandwich in thickly cut slices of crusty white, generously buttered and expertly assembled by James; in winter I might prefer hot stewed steak (always with ‘a lot of gravy’), potatoes, carrots, peas and dumplings that’d arrive steaming in a shallow bowl. On other days the perfect simplicity of ham, egg and chips. Arthur’s hand-cut chips were legend. And perhaps bananas and custard for pudding? And maybe yet another cup of tea? Invariably you’d overhear someone asking for a glass of milk and without fail, Arthur would call out ‘one white wine!’ How did we ever get any work done? Once ensconced, you didn’t want to leave. Going to lunch at Arthur’s was also about your fellow diners. King’s Gym was just across the road and huge man-mountains would come in having just finished intensive boxing training, sit down at the fixed seats, occupying the space meant for two, and consume plates piled high with carbs and calories. Arthur’s was the very first place I saw a mobile phone. 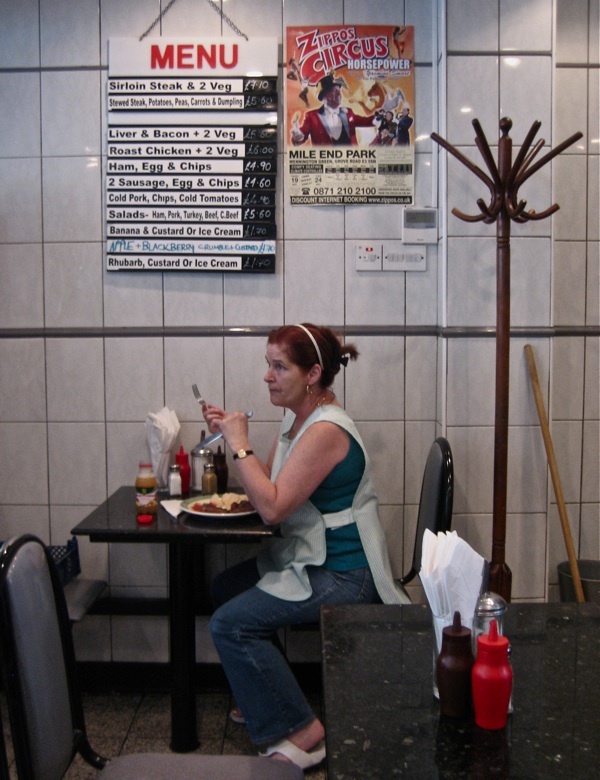 Early adopters were brickies, chippies, sparks and other tradesmen who ate at the café. Back then, the idea of ‘mobile’ was a moot point. They were the size and weight of large bricks and were slammed down ostentatiously onto the tables. Once the serious business of eating was done and the ‘Sun’ set aside a plumber might make a vain attempt to wind-up Arthur with this or that comment, laughing loudly while doing so. I don’t recall Arthur ever being worsted. He’d give as good as he got. But that was then and this is now. The hipsterfication of Dalston and much of the rest of London goes hand-in-hand with the onward march of food ‘culture’: so-called ‘street food’, anything with the prefix ‘proper’ in it and ‘pop-up’ bars, cafés, restaurants and other oh so exciting dining ‘experiences’. The first world preoccupation with the ‘local’, ‘real’, ‘heritage’, ‘foraged’, ‘sourced’, ‘seasonal’ and ‘artisanal’ has become wearisome. Are we all ‘foodies’ now? This process has taken something basic, our need to eat, and transformed it into a self-conscious lifestyle choice. Of course it doesn’t have to be like this. Arthur’s Cafe was keeping it real decades before ‘keeping it real’ was even a thing. There were times when our walk to the café revealed it was shut. Arthur and the café were taking a well-earned summer break. But our disappointment was real and profound. Where else can we go? And now Arthur has well and truly gone. And not just for the summer. I sincerely hope — as I’m sure do many, many others who’ve had the pleasure — that under Arthur’s grandson James, this venerable institution will continue long into the future. Already missed but not forgotten: Arthur of Arthur’s Cafe, thank you. Best chips in Hackney and served by a 100% gent. Arthur personified the best of the old East End, and bridged the gap into the new. Best of luck to Arthur’s grandson – top tip, don’t change the chip recipe! I use Arthur’s cafe every week sometimes 3 times a week, and have done for many, many years, as do many of my friends and family. It’s simply the best cafe in London, there isn’t a better cafe anywhere, Arthur has run this place like a finely tuned engine and it’s apparent from the moment you walk through the door, it’s immaculate, the food and service simply superb, the atmosphere unrivalled. Arthur was an absolute gentleman, a true east ender with many great stories, and hugely respected, he will be missed by thousands. Does anyone know when the funeral is due to take place and whether he is going from the café or passing by the café, I wish to pay my respects. My parents moved from nearby clarissa st haggerston to my present address in Dalston in summer 1979 and as a child growing up in 1980s i would see Arthurs cafe daily opposite the old Tempo when going DeBeauvoir school. 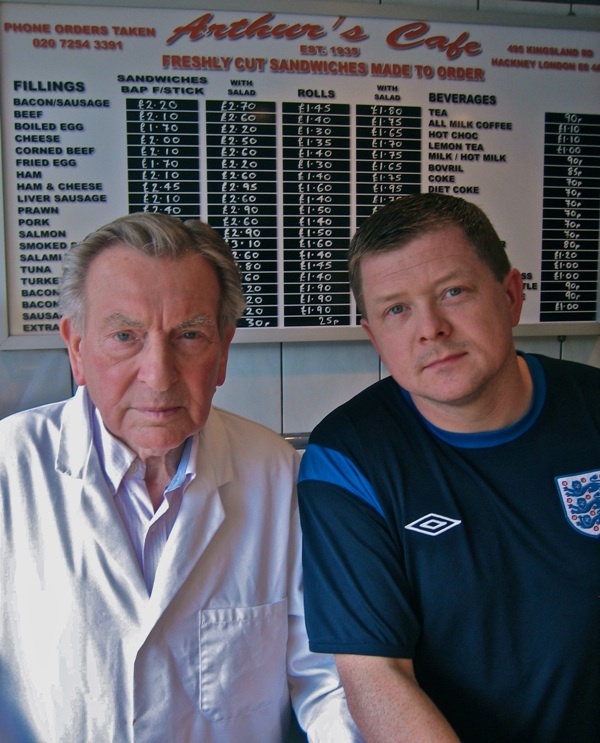 Ever since the late 1990s i would pop inside the cafe and buy the divinley made tottenham cakes absolutley delicous. thankyou James i’l miss yah..
Cant believe arthurs will serve its last breakfast on friday 25th of may i would like to wish james and staff all the best and i hope you can open up somewhere nearby im sure you’ll be well supported . Anyone know if James has found a new site yet?